Carra Beag occupies an enviable position above the town enjoying panoramic views of the surrounding hills and glen. Nestled in a quiet but central location, Carra Beag is the ideal place to relax and unwind. Set in the magnificent Tummel Valley, part of the spectacular and romantic Scottish Highlands, the spa town of Pitlochry is an unspoilt gem of the Victorian era. Our house, one of the finest of the many Victorian Villas built in that era, still retains much of its period charm. 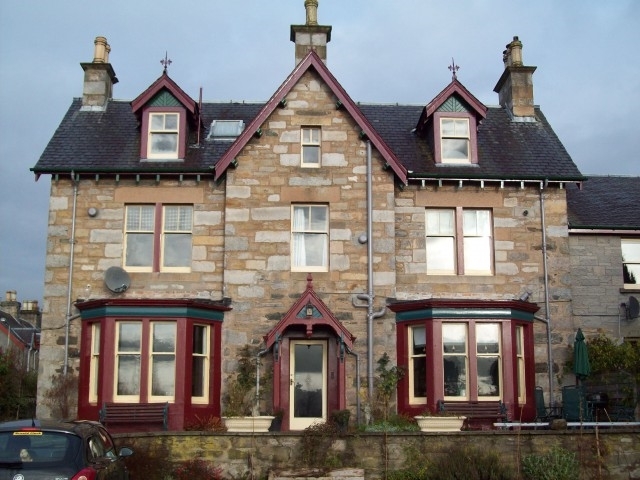 Carra Beag occupies an enviable position above the town enjoying panoramic views of the surrounding hills and glen. Nestled in a quiet but central location, Carra Beag is the ideal place to relax and unwind. A short stroll through our extensive garden will take you directly to Pitlochry’s main street. In 1875 Carra Beag was built as a family house and over the years many local notables have resided here including one of the Town’s Provost’s. In the 1950’s the house even doubled as a studio for local artist David Fergusson who painted and sketched the ever changing aspects from the upper floors of house. These days Carra Beag still is a family home where Richard & Sally extend a heartfelt welcome to guests and travellers. We pride ourselves in offering our guests excellent value for money, clean & comfortable rooms, first rate service and genuine hospitality. After a long day exploring the beautiful scenery why not relax in front of a roaring coal fire with complementary Port and chocolates in the guest lounge. Our rooms include the facilities expected by modern travelers but we try to maintain and even recreate the style of that bygone era. If you treat yourself to a getaway at Carra Beag we have special rates for stays of 3 nights or more no matter at what time of year.